Guest unit is on the first floor, overlooking patio, lawn and garden to enjoy. Enjoy a unique quiet environment within the city. With a private entrance, your space is on the first floor, overlooking a beautiful patio, lawn and garden for relaxing, dining and recreation. Pick organic vegetables and fruits from our garden in season and enjoy a 3.66m Intex pool in summer. Free easy parking on street in front of home at all times. 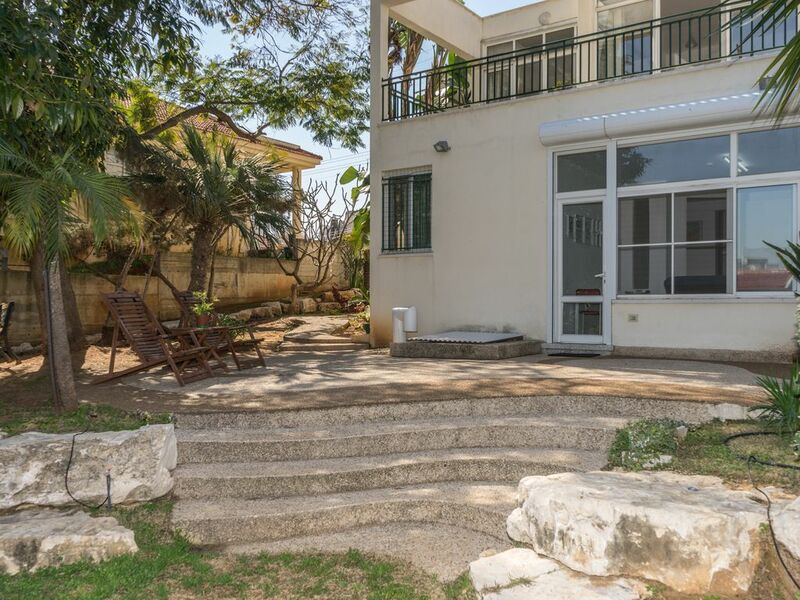 Easy access to Tel Aviv, Jerusalem and TLV Airport. Car rental and public transportation within 3 min walk. Grocery store and supermarket close by. The space includes 2 bedrooms, a fully equipped kitchen combined with a dining and living area, a full bathroom (with tub) and a beautiful patio you can enjoy anytime. The first bedroom sleeps two on a double bed, has a wardrobe and a view to our garden. The second bedroom has one double bed and one single bed, a desk, chair and wardrobe. The kitchen is fully equipped with a refrigerator, dishwasher, 4 burners gas stove, electric oven and an extractor hood. Also available are a microwave oven, toaster and electric hot water kettle. Plates, cups and all necessary kitchen utensils are ready for you in the cupboards and drawers. The kitchen is also equipped with a drinking/cooking water purification system. The dining area includes a table with 4 seats. The living area includes a sofa-bed, a coffee table, a 32" smart HDTV with Netflix service and Israel's channels 11,12,13,14 as well as a small sound/radio system. A high speed, separate WiFi network is available for guests use only. Each room is equipped with a separate air conditioning unit for on demand cooling and heating. The Bathroom includes a bath tub, shower, sink with a large mirror, toilet, space heater and hair dryer. Hot water is provided 24/7, no need to turn on boiler. Washer and dryer are available for guests' self use free of charge at all times, including all consumables. Also available are iron and ironing board. The patio is great for outdoors dining and relaxing in both sunshine and shade (weather permitting). Easy chairs as well as a round table with 4 seats are ready for you. The space is suited for a maximum of two children plus an infant (up to 2 years old). For families with an infant: we will be happy to provide you with a crib, baby's tub, a high chair and a stroller. Please send an inquiry before booking, It is best to have all questions answered at this point. Guests can access our backyard and garden for relaxing, dining and recreation. Please note that all our facilities are for booked guests only. Since we live on the upper floor, we are usually available to our guests. We can communicate in Hebrew, English and Spanish. Please feel free to ask any question or consult with us before and during your stay. Free parking is always available on street right next to our house. The cleaning fee covers cleaning costs between guests. All necessary cleaning tools and supplies, including a vacuum cleaner (upon request), are available for guests who wish to clean the unit during their stay. Bed linen and towels are available free of charge. We are a retired couple, parents to 3 grown ups and grandparents to 3 kids. We like to get to know people from all over the world here in Israel and abroad. Our guest unit is in operation on Airbnb since Feb. 2017. Our guest unit is conveniently located in the town of Rehovot, home to the Weizmann Institute of Science, The Faculty of Agriculture of The Hebrew University and the Kaplan Medical Centre. Our street is very quiet and the guest unit faces our beautiful garden, patio and lawn. The unit is very comfortable and well equipped. Our reviews are all 5 stars because we care about our guests and provide excellent service and hospitality. Rehovot is located about 30 Km south east of Tel Aviv with easy and convenient access to Jerusalem (50 Km), The Dead Sea and Masada (137 Km). Route 6 will conveniently take you to the north (Galilee) or the south (Beer Sheva) so day trips to all the famous sites are possible. We are sure you will feel at home away from home in our pleasant and well equipped guest unit. Free, separate high speed WiFi in all areas, for guests use only. Ethernet cable connection available upon request. Full size dishwasher, all consumables provided. We provide, (free of charge) instant coffee, black Turkish coffee, sugar, salt, pepper, olive oil, canola oil, bread, milk, cheese, jam, vegetables, eggs, butter and fruits. Our guests are welcome to enjoy our garden, lawn and patio. Please note that the garden and lawn are not private but shared with the hosts. A wide patio in front of the guests unit, with a round table, parasol, 4 seats and 4 easy chairs is available for dining outdoors and recreation. A wooden sun deck is available as well. This gem in Rehovot is a special place! We stayed for 5 nights and thoroughly enjoyed the apartment and its large patio and garden. The owner did everything she could to make our stay convenient and special. Sharona was a very kind person who helped us in many ways; she helped us with our directions and GPS and had stocked the refrigerator with some basic food items to welcome us! We highly recommend this apartment; it was clean, quiet and comfortable with a kitchen that had everything you would need! The garden was beautiful and it was a pleasure to sit on the patio to enjoy the view! This was one of the nicest places we have ever rented! Dear Beth and Jerry, thank you so much for staying at our place. You were perfect guests from beginning to end and I enjoyed hosting you and having the opportunity to know you while Gabi was away. Thanks for sharing gardening tips with me and hope you come again though it’s a long trip. All the best! We stayed for the second time at Sharona & Gabi's home, because we loved it. They are wonderful hosts always caring about your needs. Thank You Eva for your great review, we enjoyed hosting you and will be happy to see you again! Thank you so much for your review, Eva. We enjoy returning guests and hope to see you soon again. You are perfect guests! The Weizmann Institute of Science Visitors Centre as well as The Weizmann House are places of interest to visitors.